This beautiful cottage (as my son's girl friend insists on calling it) - was my first attempt to create a paper cottage. This was a prototype from the techniques we learnt during a crafting evening with friends. My friend Janice had the challenge of guiding us through the task - she was the teacher for the evening to help us build our paper cottages. 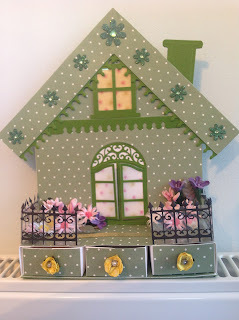 The first step was to build the three little drawers as the foundation of the house and it was important to me to decide the exact colours that I would use for the doors, windows and background paper. I used Spellbinders D-lites for the Windows, and decided to add some floral vellum behind the windows, adding yellow vellum to the top window to give the impression of a light on upstairs. The fence was again Spellbinders D-lites, which I put onto acetate so it would stay upright.